Fall 2018 - Resiliency Summit - Brazil! Molly created the topic: Fall 2018 - Resiliency Summit - Brazil! The fall season is a time of invigoration, stimulation and excitement and the Al Siebert Resiliency Center is actively invigorated, stimulated and excited! 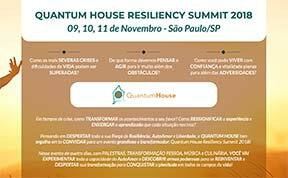 The entire team of ASRC has been invited to Claudia Riecken's Quantum House Resiliency Summit 2018: Freedom Conference in São Paulo, Brazil, November 9-11, 2018. I take great pride in saying that a portion of the Conference will be honoring my late husband, Al Siebert, a person ahead of his time regarding resiliency and being mentally healthy. Kristin Pintarich, (Al's niece and assistant) and I will be interviewed by Al's longtime friend, Glen Fahs, reminiscing about Al and his life. Glen and Michelle Atlas will be speakers along with other international speakers on related resiliency topics at the conference. Claudia and Al had a long-term friendship developing their coaching careers and mentoring others to be resilient and mentally healthy. Their close relationship spanned continents and involved wonderful concepts and ideas to help each of them succeed in their life's work. Since Al's passing, Claudia has been very supportive of me and the Al Siebert Resiliency Center. This is because of her tremendous belief in (and love of) Al's work and the work on resiliency that Glen and Michelle provide embracing Al's resiliency research in current concepts. While you may have a desire to attend in person, we recognize that not everyone is able to get to Sao Paulo in two months. We are working on providing international web access to the summit, and plan to have it translated into Portuguese, Spanish, and English. We'll send out an announcement with those details soon. We also will have some of the sessions recorded and available for purchase after the conference. Meanwhile, you may view this promotional video for the event to get you inspired! (Note: The first 5:30 is in Portuguese. The speakers are featured at the 8:00 mark). "My life sings of connections with life, spirit and you!"